Life Extension Mediterranean Trim with Sinetrol-XPur may support weight loss and a healthy lifestyle when combined with healthy diet and exercise. Cooperating well with a Mediterranean diet, Sinetrol aids fat burning enzymes in the body. In the fast paced world of today it can be hard for many to maintain a healthy weight, and most diets produce unsatisfactory results. The Mediterranean diet, however, stands out as a positive way to improve one’s weight and overall health. In combination with eating healthy and exercise, Mediterranean Trim works at the cellular level to support the body’s fat burning enzymes and increase weight loss success. In overweight individuals, fat cells have less than optimal function of an enzyme called hormone-sensitive lipase. This enzyme is required to help break down stored fat and burn it for energy.1,2 As these individuals become more overweight, their cells are less effective at removing stored fat. In a human study, subjects supplemented with citrus fruit/seed extract shed 9.73% of their white abdominal fat stores.3 This nearly 10% loss of abdominal fat promoted a healthy inflammatory response. 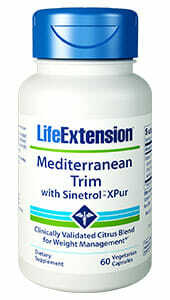 Mediterranean Trim with Sinetrol™-XPur should be used in conjunction with a healthy diet and regular exercise program. Although real-world results often vary from what is observed in placebo-controlled studies, you could experience similar benefits found in the clinical trial participants using these active ingredients. Proper use of this citrus fruit/seed blend can help jump-start a weight-loss program. Sinetrol™ is a trademark of Fytexia®. 1. Circulation. 2008 Jan 15;117(2):169-75.